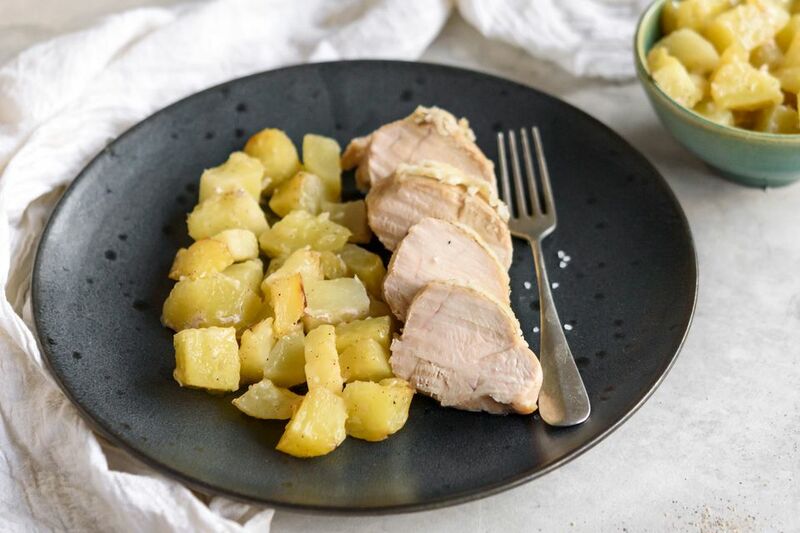 This baked chicken and potatoes recipe is perfect for busy weeknights. There isn't much prep time and it's practically a meal in one dish. Though it is to be noted that it also works well with a side salad. So simple, yet so delectable. Preheat oven to 425 F. Spray a 9-by-13-inch baking dish with cooking spray. Toss potatoes, 1/4 cup of the olive oil, salt, pepper, and garlic powder together. Spread into a prepared baking dish in a single layer. Bake 10 minutes. Place chicken on top of potatoes, arranging potatoes around chicken. Brush remaining tablespoon of olive oil on top of chicken. Season with salt and pepper. Return to oven and bake 18 to 20 minutes until juices of chicken run clear. Top with shredded parmesan cheese. Return to oven and bake until cheese melts, about 2 minutes. Try mixing the potatoes with olive oil, 1 tablespoon of chopped rosemary, and 1 to 2 teaspoons minced garlic for some more depth of flavor. Or, trying mixing the potatoes with olive oil, 1 teaspoon chopped thyme, and 1 teaspoon lemon juice for a brighter, more zesty option.